How Do You Manage Moderate to Severe Duodenal Crohn’s Disease? Previous epidemiological studies have shown that Crohn’s disease (CD) is limited to the small bowel in 31% of patients. Most of the small bowel disease is located in the ileum. Isolated colonic disease (11%) and ileocecal involvement (58%) comprise the remainder of the other cases. Gastroduodenal involvement is rare, occurring in only 0.5% to 4% of all cases.1-3 The prevalence of gastroduodenal CD is now probably higher than this as the disease entity has become more recognized over the last 20 years, particularly with patients’ increased willingness to pursue upper endoscopy. There is a 20% higher incidence in males.4 Because of proximity, CD lesions can locally erode into the pancreas or obstruct the pancreatic duct leading to pancreatitis. Hence, gastroduodenal CD should be considered if CD patients have pancreatitis. The treatment for moderate to severe duodenal CD can be medical, endoscopic, or surgical. Similar to other treatments for CD, the objective is to avoid surgical treatment as long as possible in order to prevent short bowel syndrome and other complications related to surgical resection. The proximal duodenum, in particular, is a difficult area to resect. There is no strong evidence for proton pump inhibitors (PPI), but generally, we believe that this class of medication may be helpful in facilitating healing by reducing gastric acidity, which may be directly injurious or, at a miminum, interfere with healing. Some of the other medical therapies that can be used in duodenal CD include corticosteroids, immunomodulators like azathioprine and methotrexate (MTX), and anti-tumor necrosis factor (TNF) therapy like infliximab and adalimumab. Five-aminosalicyclic acid (5-ASA) products do not have a role in treating gastroduodenal CD. When patients have a short segment of duodenal stricture, endoscopic balloon dilatation can be very effective. When corticosteroids or balloon dilation are required, immunomodulators should be used to facilitate maintenance of remission. An alternate approach is using anti-TNF agents to settle active disease and to maintain remission, either with or without concurrent immunomodulators. In addition, surgical treatments such as stricturoplasty can be considered in cases with longer segments of duodenal strictures as an alternative to duodenal resection. Although total parenteral nutrition (TPN) and bowel rest have been used, there are no trials that support its benefit in severe CD. Patients with obstruction secondary to duodenal CD may benefit from TPN if they have lost over 10% of their body weight and are awaiting surgery. Enteral nutrition via tube feeding, or if a patient can tolerate sufficient orally ingested quantities, is an alternate approach to supplement nutrition or to facilitate symptom reduction. Patients should use multivitamin supplementation, and calcium and vitamin D supplementation should be considered unless patients have sufficient dietary intake of these two nutrients. As the proximal duodenum is the site of iron absorption, iron deficiency should also be considered. Serum ferritin, vitamin B12, and vitamin D levels should be checked in all CD patients and replaced as necessary. For patients who live in more northern climates with reduced sun exposure, vitamin D supplementation can be considered routinely. Generally, evidence for PPI use is lacking in the literature. Theoretically, PPIs help reduce acid and, in combination with other treatments for duodenal CD, may help with healing. PPIs are also useful because it is not always clear whether the ulcers found are secondary to CD, and a trial of PPI typically has few side effects. 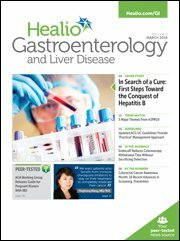 In one series of 17 patients with duodenal CD, 5 out of 10 patients receiving cimetidine or antacids in conjunction with prednisone had response rates lasting 2 to 9 months.4 One interesting study suggested that acid production may be related to the length of the bowel. Shorter bowel lengths were associated with a higher degree of acid production. Thus, duodenal CD patients who undergo surgical resection of their small bowel may benefit from prophylactic PPIs.5 While well tolerated, emerging evidence about the association of osteoporosis and hip fracture as well as Clostridium difficile (C. difficile) infections in PPI users should encourage well-done clinical trials of PPI use in gastroduodenal CD, since long-term use may not be as innocuous as we have previously considered. Corticosteroids can be useful in the treatment of small bowel CD, but unfortunately, like in other areas of IBD, treatment is only a short-term solution because it is associated with many side effects. It can be a useful bridge to immunomodulator therapy such as azathioprine and MTX. There have been no data assessing the effectiveness of budesonide in gastroduodenal CD. Although, based on the release profile for budesonide, it is doubtful to have a benefit. Since its introduction in 1997, infliximab has revolutionalized complicated small bowel CD treatment. To date, there are 2 reports of severe duodenal CD patients who have failed previous treatment with other medical therapies and surgeries who responded to infliximab.7,8 It is likely that adalimumab will have similar benefits to infliximab in proximal CD. Endoscopic balloon dilation is a viable alternative to surgery in cases where there is a short stricture length of less than 2 cm. As the length of stricture increases, so does the risk of perforation. When strictures are identified, it implies that the disease is assuming a more aggressive phenotype, and more advanced therapy such as immunomodulatory agents should be considered, even if stricture dilation is proving successful. A study in 1989 by the Lahey Clinic suggested that 38.5% of patients with duodenal CD fail medical therapy and ultimately require surgery.9 Bypass procedures such as gastrojejunostomy were previously the most common surgery for duodenal CD. Other surgeries include Roux-en-Y duodenojejunostomy. The main indication for this surgery is gastroduodenal obstruction. Unfortunately, a high percentage of CD patients with surgery have sequelae requiring further surgery. In one study of 10 patients with duodenal disease treated with surgery, 7 required 10 surgeries for marginal ulceration, obstruction at or in 1 limb of the gastrojejunostomy secondary to recurring jejunal CD, or duodenal fistula. The follow-up was 13.9 years on average.10 Recently, stricturoplasty has fallen into favor, mainly for bowel conservation purposes. Also, the recent advances in immunosuppressive therapy have made surgery a much less sought-after solution. Moderate to severe CD is becoming a disease that is much more recognized than in the past. Our armentarium of treatments have increased significantly, and we are significantly improving our ability to manage this disorder without resorting to surgical resection. 1. Nugent FW, Richmond M, Park SK. Crohn’s disease of the duodenum. Gut. 1977;18(2):115-120. 2. Fielding JF, Toye DK, Beton DC, Cooke WT. Crohn’s disease of the stomach and duodenum. Gut. 1970;11(12):1001-1006. 3. Reynolds HL, Stellato TA. Crohn’s disease of the foregut. Surg Clin North Am. 2001;81(1):117-135. 4. Murray JJ, Schoetz DJ, Nugent FW, Coller JA, Veindenheimer MC. Surgical management of Crohn’s disease involving the duodenum. Am J Surg. 1984;147(1):58-65. 5. Fielding J, Cooke WT, Williams JA. Gastric-acid secretion and duodenal ulcer in Crohn’s disease. Brit J Surg. 1970;57(11):854. 6. Miehsler W, Püspök A, Oberhuber T, Vogelsang H. Impact of different therapeutic regimens on the outcome of patients with Crohn’s disease of the upper gastrointestinal tract. Inflamm Bowel Dis. 2001;7(2):99-105. 7. Odashima M, Otaka M, Jin M, et al. Successful treatment of refractory duodenal Crohn’s disease with infliximab. Dig Dis Sci. 2007;52(1):31-32. 8. Knapp A. Successful infliximab therapy for a duodenal stricture caused by Crohn’s disease. Inflamm Bowel Dis. 2005;11(12):1123-1125. 9. Nugent FW, Roy MA. Duodenal Crohn’s disease: an analysis of 89 cases. Am J Gastroenterol. 1989;84(3):249-254. 10. Ross TM, Fazio VW, Farmer RG. Long-term results of surgical treatment for Crohn’s disease of the duodenum. Ann Surg. 1983;197(4):399-406.